When Islamists and other anti-Israel groups gather, they've learned to use euphemisms to take the edges off some of their more extreme views. They don't call for Israel's annihilation like Iran's leaders do, they just lock on to a "right of return" demand that demographically would wipe out the Jewish state. And they use slogans such as, "From the River to the Sea, Palestine will be Free," which geographically leaves no room for Israel. The usual demonization of Israel was present last weekend in St. Paul when the U.S. Campaign for Palestinian Rights (USCPR), an umbrella group leading the BDS push to isolate and weaken Israel through boycotts and divestment drives, held a major conference. 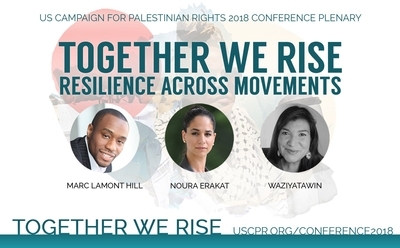 It is common for Islamists and pro-Palestinian activists to sanitize terrorist attacks as "legitimate resistance" at such events, but three USCPR speakers came right out and made a case for violence, going much further than "boycotts and divestment." Two are university professors, including one who is a frequent CNN pundit. One made a point of praising a terrorist murderer. The other diminished non-violent protest as a path for Palestinians to follow by saying "this nonviolent thing" can be too limiting, and raising a question "what legitimate resistance looks like." Those words were from Marc Lamont Hill, a Temple University professor, BET host and CNN contributor, who warned his audience against adopting "a civil rights tradition which romanticizes nonviolence. That's the challenge ... that's the challenge. It romanticizes nonviolence, but how can you romanticize nonviolence when you have a state that is at all moments waging war against you, against your bodies, poisoning your water, limiting your access to water, locking up your children, killing you. We can't romanticize resistance." That's a gross misrepresentation of the conflict, ignoring the role Palestinian incitement and an intra-Palestinian political struggle fuels the conflict today. But even if it were close to fair, somehow, Gandhi managed to grapple with that challenge and ultimately prevailed. Martin Luther King and his followers – men, women and children – endured murders, terrorist attacks, brutal beatings, police dogs and fire hoses. But by steadfastly holding to the "romanticized" principle of nonviolence, they ended school segregation and secured passage of the Civil Rights Act in 1964 and the Voting Rights Act in 1965. "The aftermath of nonviolence is the creation of the beloved community" King said often, "while the aftermath of the violence is tragic bitterness." For Palestinian advocates, "nonviolent protest" includes throwing grenades and other explosives, using kites to spark massive wildfires, all under the direction of Hamas, the terrorist organization that runs Gaza. But as Hill said at the end of the clip, "we have allowed this nonviolent thing to become so normative that we're undermining our own ability to resist in real robust ways." The USCPR audience embraced his comments. It is an umbrella organization considered a leader in the BDS movement. Member organizations include anti-Israel groups Jewish Voice for Peace (JVP), American Muslims for Palestine (AMP), Students for Justice in Palestine (SJP), and Code Pink. Like USCPR, BNC is a coalition. One member, the Council of National and Islamic Forces in Palestine, includes five Palestinian terrorist groups, including Hamas, Palestinian Islamic Jihad, two Popular Front for the Liberation of Palestine wings, and the Palestine Liberation Front (PFLP). Palestinian writer Miriam Barghouti reminded the USCPR conference that "Palestine from the river to the sea is our demand." And like Hill, she tried to cast Palestinian violence somehow as rare, but sometimes good. "For instance, when the knife attacks were happening in Palestine a few years ago – 2015? 2015. You know, Palestinian youth were out in the streets carrying out knife attacks and I'd hear Palestinians and Palestinian representation scurrying away from this topic," she said. "No one really wanted to talk about it because it shatters the image of the approachable nonviolent Palestinian that's standing bare-chested in front of Israeli soldiers that are carrying arms. And suddenly we were confronted with anger and that made us uncomfortable. And it's this discomfort with anger, this discomfort with violence that has created a huge gap when we speak about Palestinian resistance." "The approachable nonviolent Palestinian?" The Palestinian Authority doesn't name community centers and schools for heroes of nonviolence. It does name public places for terrorists who killed Israeli civilians. It pays the families of dead and imprisoned terrorists on a sliding scale that gives greater reward to more violent attacks. Hamas officials routinely make it clear that their goal is nothing short of Israel's annihilation. The USCPR conference featured no talk about peaceful negotiations to end the conflict. No talk about pressuring Hamas to renounce terror and devote its resources to improving the quality of life for Palestinians in Gaza. But it did feature praise for a Jew killer. George Mason University Assistant Professor Noura Erakat helped open the conference by hailing Rasmieh Odeh, who helped blow up a Jerusalem grocery store in 1969, killing two Israeli college students. Odeh is not a terrorist, Erakat said, but "our dear sister [and] freedom fighter." In another session, the audience was instructed what to do if anyone asks whether they support Hamas. The answer? Evade the question. Say you support Palestinians living in Gaza. When an unidentified audience member described the strategy, Tanya Keilani from the Institute for Middle East Understanding (IMEU) endorsed it wholeheartedly. "That also brings us to what you were saying, which is how do I deal with the Hamas question, right? [Unidentified name] did so well. And again to bring it back to the root cause, reminding people of the root cause is super important, right? Also noting that throughout history people have responded to oppression in various ways, right? But we all know that nothing justifies this form of oppression, right? So bringing it back to the root cause, redirecting. No one needs to know the details of the Hamas charter. There, you know, what date this happened, what meeting or negotiation or whatever. It's too much information, so it's usually a diversion tactic." The USCPR conference comes weeks after the Islamic Society of North America (ISNA) held a convention featuring an admonition not to "humanize" Israelis, a denial of Palestinian radicalism and incitement, and anti-Semitic conspiracy theories. And like ISNA, the USCPR conference makes it clear the goal is not peace, with no ambition for anything but tragic bitterness.